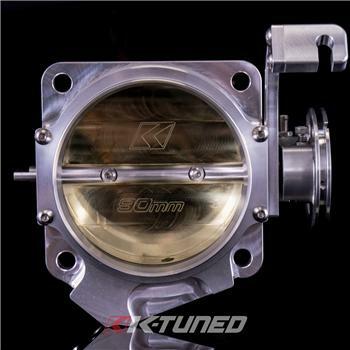 The K-Tuned 90mm Throttle Body is now available in a K-Series specific application which includes a flange location to connect the factory K-Series Idle Air Control Valve (IACV). The IACV is computer activated sensor which creates a controlled vacuum leak to help maintain a stable target idle. When properly connected, K-Pro and other K-Series programmable ecus will allow the tuner to enter a target rpm that the computer will reference. We still kept the bolt pattern from the 86-93 Ford Mustang 5.0L so the this throttlebody will bolt up perfectly to some of the bigger aftermarket intake manifolds just like our original 90mm designs. Our 90mm K-Series TB comes standard with 3.5” hose barb inlet, but we also have 3.75” and 4” sizes available to purchase separately. We also have optional V-band or Vanjen (Wiggins style) inlets available separately in both 3.5” or 4” sizes. All of these inlets are interchangeable, so they bolt on easily and eliminate the need for any welding. The throttle body and inlet are o-ring sealed so there is no need for any gaskets. The OEM K-Series MAP sensor and IACV are both a direct bolt on, with the ports located on the bottom of the TB, where they are out of view for a cleaner look. You’ll notice that we have two different part numbers listed for this K-Series TB, one option comes with a K TPS flange and the second option with a B TPS flange. Please note that the 5V signal range of both TPS sensors is identical so this option offers even more choice on the final intake setup. The throttle cable connection is made using a fully adjustable throttle rotor with 10 settings and a reversible throttle cable bracket. This bracket allows the user to run the cable on top like the OEM setup or tucked on the bottom. All K-Tuned Throttle Bodies are constructed with 6061 billet aluminum with a brass throttle blade and a stainless steel, center-less ground, throttle shaft that is leak tested to 90psi. They are also 100% North American made as are all the raw materials.